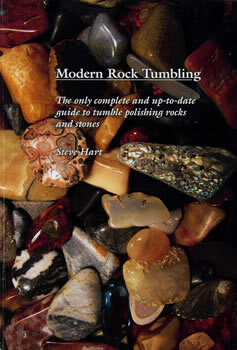 Rock Tumbling Book - "Modern Rock Tumbling"
We have read every book about tumbling that we could find. From that reading we have found that there are only a few books that explain tumbling with great clarity and genuine knowledge. Of those, we believe that Steve Hart has produced the best one. It explains the tumbling process completely and provides enough detail that you should produce excellent results if you follow his instructions. There are very few places where you can learn how to tumble polish rocks from an expert. Without that you will make a lot of mistakes and spend lots of time and money producing less than excellent results. If you are just getting started read this book and you will be off to a great start. If you know a lot you will probably still learn many valuable things. The price might seem a bit high for a 96-page book but we found it well worth the cost. Format: 9" x 6", paperback.